Though Brazil's Fred and Neymar combined to score every goal in their side's 3-0 win against Spain in the Confederations Cup final, neither of them could score more goals than confounding trophy collector Fernando Torres over the entirety of the tournament. Torres was awarded the Golden Boot for finishing with five goals, the same number as Fred and one more than Neymar. And given the unenjoyable result for his team, he understandably looked less than thrilled about his unwearable new shoe. As he did at Euro 2012, Torres won the award on a combination of tie-breakers. Torres and Fred both had just one assist, so it had to be decided on fewer minutes played, once again proving Torres to be the most formidable...ish scorer in a given competition since he played just 273 minutes to Fred's 423. Which also proves that Torres possesses the even more admirable trait of being supremely economical (as long as we're not talking about transfer fees — no one say anything about transfer fees!). 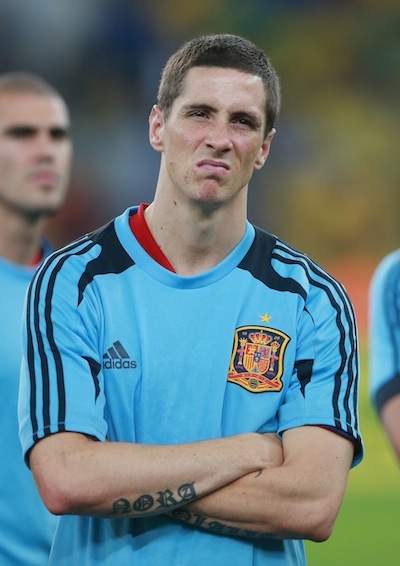 The manner in which Torres won the award might have also contributed to his reaction. Not unlike the way he pumped up his meager goal harvest with Chelsea by scoring 22 times last season (including eight goals in 36 Premier League appearances and six in five Europea League appearances), he scored all five of his goals in the group stage — four against cruelly outmatched Tahiti and one against the only team Tahiti themselves could score against: Nigeria. So when you combine all of these factors, you get a man holding a trophy while maintaining the facial expression you see above. But emotions and Tahiti's generous inferiority are just easily ignorable footnotes to the fact that even when Spain take a break from winning trophies, Fernando Torres does not. Since 2010, Torres has now won the World Cup, the European Championship (his second), the FA Cup, Champions League, and Europa League, plus the Euro 2012 Golden Boot and 2013 Confederations Cup Golden Boot. In other words, he is everything Lionel Messi could have been (if Messi chose to represent Spain instead of Argentina and was willing to make formal transfer requests in order to shut Andy Gray's big dumb mouth).